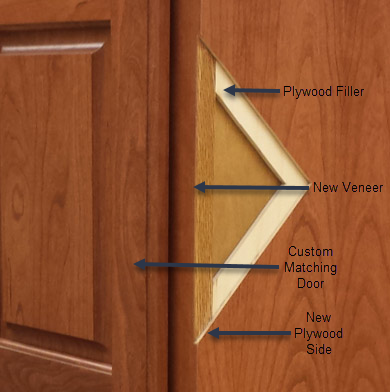 Cabinet Refacing is the process of adding veneer, laminate or other material to the exterior of your existing cabinets. Custom matched doors and drawer fronts are created to give the cabinet a specific style. New matching moldings, hinges, knobs and or pulls are added to complete the transformation. New drawer boxes and drawer slides are commonly required for the new materials to look and function properly. Cabinet Refacing takes an average of 3-5 days and you are able to use your kitchen at the end of each day. Cabinet Refacing is the process of adding veneer, laminate or other material to the exterior of your existing cabinets. Custom matched doors and drawer fronts are created to give the cabinet a specific style. New matching moldings, hinges, knobs and or pulls are added to complete the transformation. New drawer boxes and drawer slides are commonly required for the new materials to function and look properly. A typical refacing job is completed in 5 days or less. Refacing will last decades if properly applied by a properly trained professional. Rest assured that we hold the highest standards possible and only install high quality materials. Cabinet refacing costs between 200-800 per linear foot. This amount depends on the material chosen. Man made materials like RTF, laminate vinyl and others rage between 200-500 depending on material and door style. Real wood veneer and painted material ranges between 400-800 depending on species of wood and door style. How much are new cabinets vs Cabinet refacing? New cabinets pricing wise, they're listed in order—stock cabinets are cheapest, at around $100 to $200 per linear foot, semi-custom cabinets will run you around $200 to $650 per linear foot, and custom cabinets usually cost between $500 and $1,200 per linear foot. These prices don't include removal of the existing cabinets, installation of the new cabinets or the cost of adding a new countertop, sink and faucet. Cabinet refacing cost less than replacing your cabinets with custom cabinets. Generally it will cost about 50% less than the cost of custom cabinets with installation. What are the advantages of refacing vs replacing cabinets? 1. Refacing is eco friendly, reducing the amount of material that find its way to landfills. 2. Cabinet refacing will give you the look of new cabinets for up to 50% less then custom cabinets. 3. Refacing allows you to save your existing countertop which can be an enormous expense if you just want to update the cabinets. 4. Cabinet refacing projects typically take less time than a cabinet installation or kitchen remodeling project. Most refacing projects take 3-5 days vs installation projects can take 2-6 weeks depending on the size and scope of the project. What are the disadvantages of cabinet refacing? 1. Your cabinet boxes remain the same. If you have 20 year old cabinets that look like their 20 years old on the inside, refacing wont change this.